What will showers be like? Cooking? Campsites? Medical Facilities? Packing? Get short, descriptive packets of information on all the logistics you want to know from the host here! Got questions about the application process? Check out this step by step guide. Here is a list of IST Positions for the World Jamboree. This file was last updated on August 11, 2018. Want to apply as an adult leader? Check here to make sure you meet all the selection criteria. Note: IST selection criteria is set by the Host team and not posted here. Curious about the Contingent Refund Policy? Here is your copy to reference and share. Applying for a scholarship? Download and follow this step-by-step application guide. Information about applying as a participant, unit leader and International Service Team (IST – Staff). Updated August 21, 2018. Learn more about the Contingent Scholarship program and share with your friends, unit, council, and others who are interested. Jamboree is getting closer every day. WoJam 3 talks about how to start getting ready, physically, socially, logistically, and more! Check it out! Our December Newsletter is out! Check out the latests on travel, safety, and program information! 2019 means the Jamboree is getting close! Our March edition of WoJam Unlocked includes updates on Swag, Health & Safety, Program, and how to prepare in the last few months before the Jamboree. Check it out now! Check out our first Contingent newsletter! Read about the new scholarship program, ways to promote the Jamboree, a special note to each member of the Contingent from Young Adult Contingent Leader Rachel Eddowes, and more! Here’s our second contingent newsletter! This edition gives a virtual tour of the Jamboree program, an update on application statuses, A SWAG update, a Scholarship update, information on World Scouting, and more. Download it. Read it. Share it with all your friends! This Flash Friday brought us a swag update as well as food! From cooking at the Jamboree to the retail food options, including a spotlight on Café USA, Boy Scouts of America’s first World Jamboree food house. Get more involved with this Flash Friday, covering the new contingent Facebook groups, the Global Ambassador Program, and a blog post with BSA International Commissioner Kent Clayburn. This Flash Friday brought us the fifth(!) edition of WoJam Unlocked! This Flash Friday’s looks at the Contingent Training (found here), the Jamboree Day Visitor Program, and memories from the last US-based World Jamboree in 1967. This Flash Friday covered Swag and guidelines for developing your own unit swag. This Flash Friday really got off the ground, talking about Aerial Adventures and Climbing programs. This Flash Friday’s focus was Water, covering everything from Water Bottles and Showers to Aquatic Activities. This Flash Friday was all about the Jamboree shows. This Flash Friday’s introduced the new Contingent Training. This Flash Friday was a New Years greeting, sending us into the long-awaited 2019 Jamboree Year. This Flash Friday focused on footwear. This Flash Friday looked at how best to pack and prepare for the weather. This Flash Friday covered Shooting Sports, the Aerial Program, Extreme Sports, and Camp Life. This Flash Friday looked at camp life, from the basecamp names to the daily meals. This three-page document succinctly covers the basic Jamboree information. It’s great for quickly getting people to understand just what the World Jamboree is and how to join the US Contingent. Spread the word about our unique IST (Staff) opportunities for 18-25 year-olds. Print the full-sized flyer for more information. The quarter-sized flyers are perfect for spreading the word far and wide at big events. The Social Media photos are also a great way to engage digital audiences. What is the Rover Brigade? Find out on our blog. Click and save or print this one-page flyer with information about the 2019 WSJ USA Contingent. This flyer is targetted specifically towards our female audience. For the Northeast, Central, and Southern Region use the general flyer. For the Western Region, use the Western Flyer. Comes in two versions – Color and Monochrome. 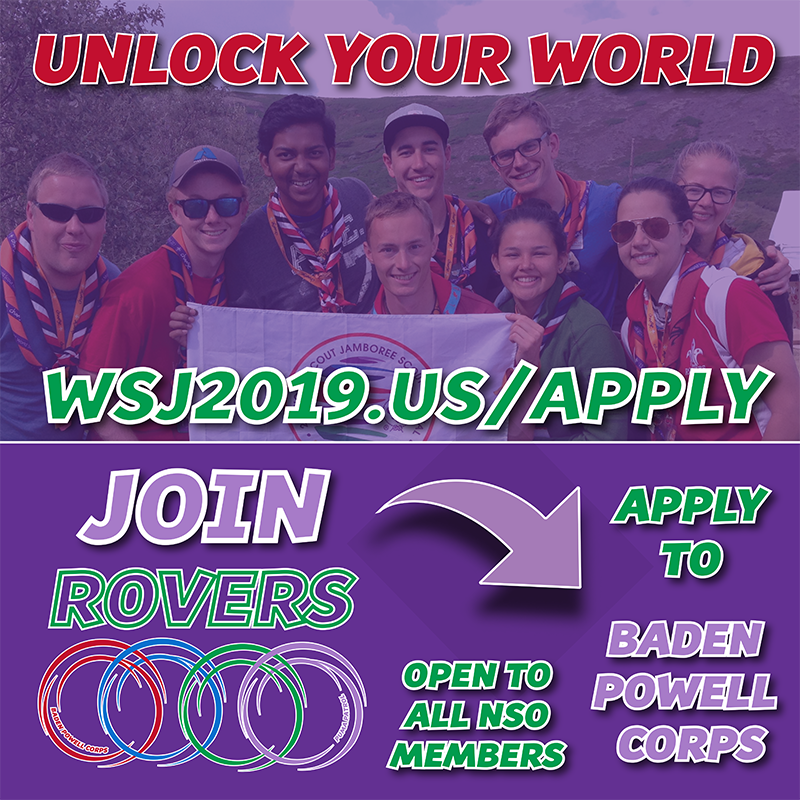 Click and save or print this one-page flyer with information about the 2019 WSJ USA Contingent. For the Northeast, Central, and Southern Region, use the general flyer. For the Western Region, use the Western Flyer. Comes in two versions – Color and Monochrome. Download our newest powerpoint presentation to use when promoting the US Contingent! Note: the auto-advance powerpoint will change slides every 10 seconds. The PDF version can be presented in the Adobe Acrobat Reader by clicking Control-L (PC) or Command-L (Mac) on your computer. Looking for a quick and environmentally-friendly way to spread the word about the Jamboree? Check out our new mini-flyer! With four flyers per printer sheet, you get four times the promotional reach per page! After all, a Scout is thrifty (and cares about the environment)! Download and print this 2’x4′ banner for use at all your promotional events. Great for District, Council, Area, and Regional events, this eye-catching banner will help you spread the word about the US Contingent! Download the banner to a flash drive and take to your local print shop (e.g. FedEx) to print. Note: This is a large .pdf image file and may take a while to download. To expediate this, the file downloads as a .zip file which you may then have to “unzip” on your computer in order to access the pdf. 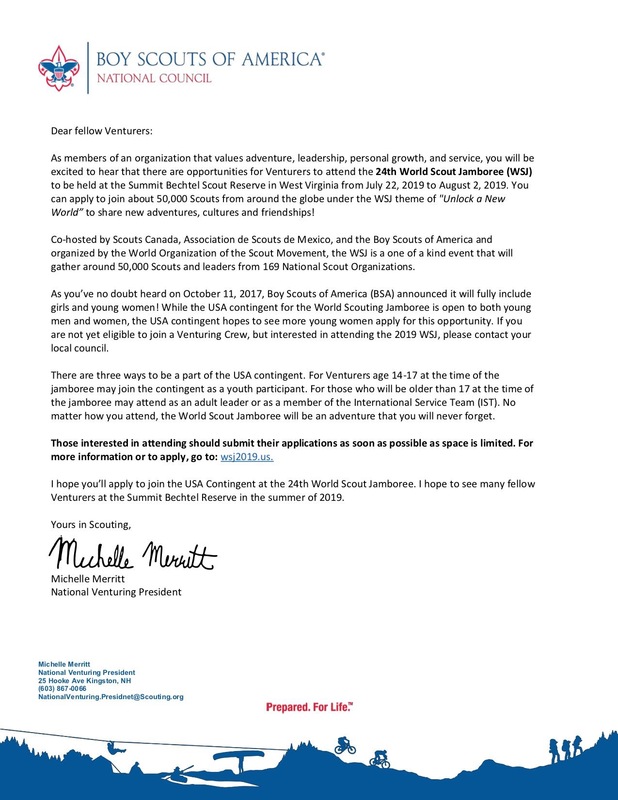 Print your own copy of Michelle Merrit’s Jamboree letter to Venturers to share! This resource is for Councils who want to promote the WSJ by email to their eligible Scouts and Scouters. Here is an image you can use for Social Media or Email Marketing. Enjoy! Here are some great ideas on how you can promote the World Scout Jamboree in your local Council. Check out this great video about the activities that await you at the WSJ! Learn all about camping at the World Scout Jamboree in this video! Learn about the Cooking and Food systems that will be in place at the 24th World Scout Jamboree! Watch out Q&A Session with CMT Members Mark Beese and Hannah Wheaton from the CMT Meeting last February. 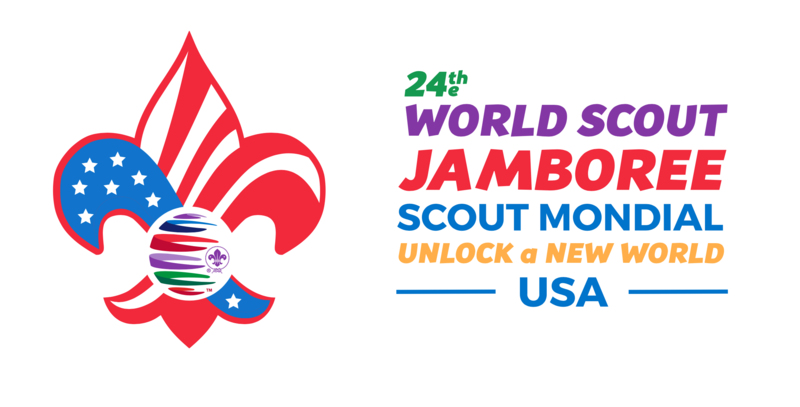 Learn how to help the US Contingent promote the World Scout Jamboree! This video will provide good strategies (both traditional and digital) to help spread the word about this once-in-a-lifetime opportunity. Use this video on your Council website, Facebook page or at events to promote the Jamboree. This is the short – one minute 15 second version. Use this video on your Council website, Facebook page or at events to promote the Jamboree. This is the long version – three minute 30 second version. 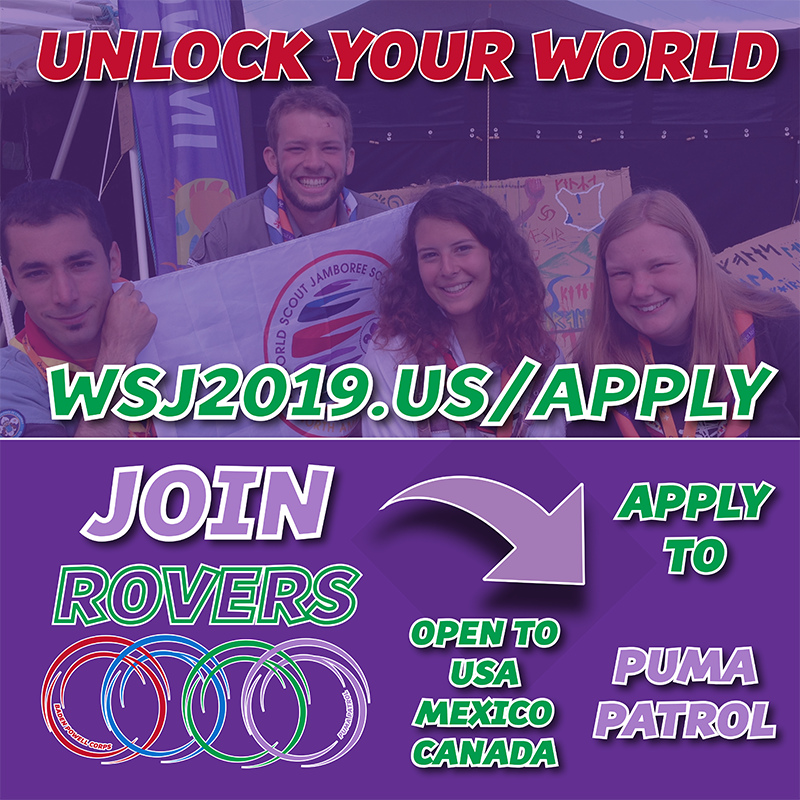 Elyse Wyatt, Assistant SPL for the Puma Patrol at the 2019 WSJ, shares why she’s excited to be part of the Puma Patrol in the World Jamboree’s Rover Brigade. Brandon Kelly, Assistant SPL for Mobilizations in the WSJ 2019 Rover Brigade shares why he’s excited to be a part of the Rover Brigade and the World Jamboree next summer!